I’m your personal nutritionist. Choose the lifestyle you want to live and let me help you achieve your goals in a sustainable way. I tried many times to have a more balanced diet and a healthier lifestyle. Often it works out well, especially during the first couple of weeks, then suddenly life kicks in. Stress, holidays, hard work and that’s when everything starts going the wrong way. ZOE helps me achieve a healthier lifestyle with personalized food recommendations. Small, delicious, healthy daily wins which add up significantly at the end of every week. I also track my daily activity like steps and calories using my smartphone (and smartwatch) and ZOE uses this information to provide me with personalized food recommendations to achieve my goals and keep me on track. If i don’t like something I skip the recommendation and choose another one. Once it’s about time for lunch or dinner, ZOE suggests a delicious meal in a restaurant or food shop nearby. If I’m not in the mood for this particular dish, I just swipe left and can choose another one. Even when I’m out with my friends in our favorite restaurant, ZOE suggest the meals that suit my desired lifestyle. As the owner of a small local restaurant/food stand, I’m getting more guests, as they learn about the daily menus suiting their way of living. It’s a great feeling knowing, that you don’t only offer your guests a delicious meal but also help them achieve their personal goals. I was astonished to see, how it easy it is to use. I just upload a picture of the daily dishes, check the approximate nutritional values and the meal is ready to be recommended. As the store manager in the local branch I feel the difference in people’s demand. While most of the customers used to roam around the shop not knowing what to eat, they now go straight to the product and buy it. I also noticed, that the price sensitivity in regards to their lunch or dinner shops has decreased. As the information about our products is automatically provided to ZOE via our ERPs API there is no additional workload at all. ZOE learns about restaurant/markets details (Location, Opening Hours etc.) by registration and/or scraping the web. As the goal is personal behavior change, the accuracy of the data provided from tracking and nutrition is at a suitable level. The static data generated, e.g. restaurants location, opening hours etc. will be provided as data sets for the open data movement. Additional data may be provided for other projects, using the data e.g. for food waste optimization etc. The business plan development phase will study the monetization of data in depth, taking privacy policies such as GDPR and local laws into consideration. The core of the value proposal is an easy way to change the habits of a consumer. Compliance is a critical key success factors for any kind of intervention to achieve a defined health objective. In general only ca 5-8% of the consumers still follow the recommendations after one year. The Behavioral Change will trigger a change in food intake and provide a measurable health benefit. 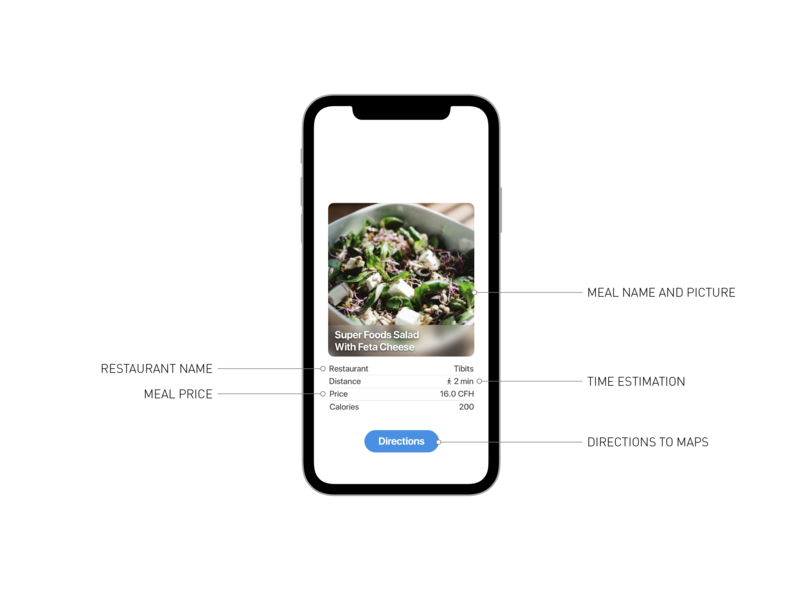 ZOE is currently a clickable prototype so get a good impression of the functionality and a possible look and feel of the final app. The necessary data-sources were established and checked and allow ZOE to get the data needed to provide the guidance for the users she aims for. 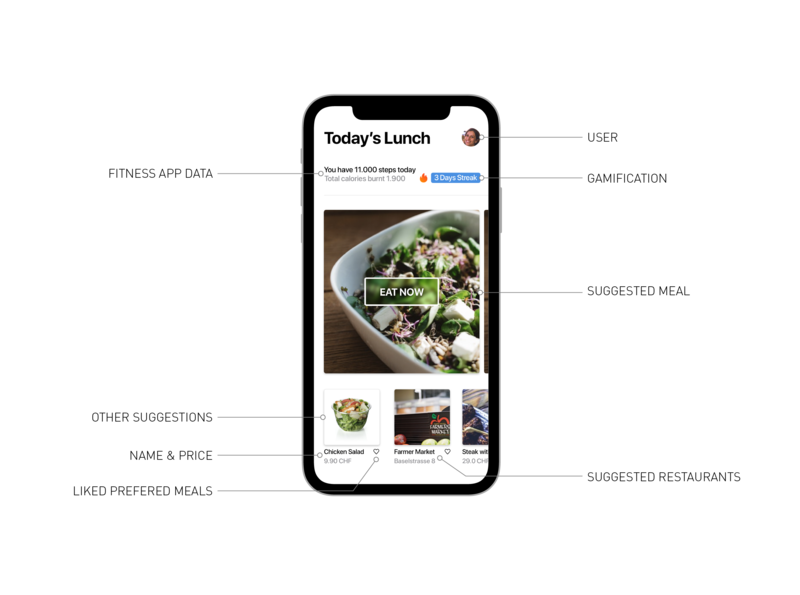 ZOE will now establish a solid business plan in detail to ensure a funding which allows the team to create the working app as well as promote the app to local businesses, restaurants and most importantly to the people using the app to improve their lifestyle.